Seminarian Liam Hosty walked slowly around the priests’ circle in Calvary Cemetery in Indianapolis, looking for a particular grave. He wanted to see the burial place of Father Joseph MacNally, his pastor at St. Barnabas Parish in Indianapolis when he was a boy. Finally coming upon it, he squatted down to spend some time by it. The moment was emotional for Hosty, a new archdiocesan seminarian who is a freshman at Bishop Simon Bruté College Seminary and Marian University, both in Indianapolis. “I remember him as a kid,” Hosty said of the priest who was commonly known as “Father Mac.” “He was an older priest at the time. But he’s one of the inspirations of why I wanted to become a seminarian. I remember how gentle he was. Seeing his pastor from years ago buried among so many other priests also helped Hosty appreciate the “legacy” that he and his fellow archdiocesan seminarians are continuing. “We have a long line of excellent priests, such as Father Mac,” Hosty said. He and his fellow archdiocesan seminarians visited Calvary Cemetery on Aug. 10 as part of their annual convocation before they begin another year of priestly formation at their seminaries. In most years, the seminarians make a pilgrimage to historic churches in different corners of the Church in central and southern Indiana. Since the Church is in the midst of the Holy Year of Mercy, archdiocesan vocations director Father Eric Augenstein thought it would be good to help the seminarians do various works of mercy together at different locations in Indianapolis. 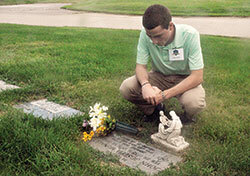 They prayed for the dead at Calvary and nearby Holy Cross and St. Joseph cemeteries. They helped feed the hungry by volunteering at the St. Vincent de Paul Food Pantry. And they visited the sick by spending time with the residents of the St. Augustine Home for the Aged. They also visited SS. Peter and Paul Cathedral in Indianapolis, getting the chance to walk through the holy doors there and receive the plenary indulgence tied to them. Father Augenstein commented on this change in the convocation while the seminarians were filling boxes with canned drinks for the clients of the food pantry. New seminarian Owen Duckett, a member of Our Lady of the Most Holy Rosary Parish in Indianapolis, appreciated starting his priestly formation for the archdiocese while volunteering at the food pantry. Seminarian Vincent Gilmore, a member of St. Monica Parish in Indianapolis, knows from his few years of experience as an archdiocesan seminarian how much opportunities for service like the ones he shared during the convocation can mean in priestly formation. “When I sit down to pray the Liturgy of the Hours or a holy hour, I’ll remember the people that I encountered here,” said Gilmore, who is in second year of theology at Saint Meinrad Seminary and School of Theology in St. Meinrad. “I try to take them with me in prayer, and try to enter a little bit into their minds and hearts in what limited ways I can to try to be there with them. Charlie Wessel liked making connections with the residents of the St. Augustine Home. A member of St. Simon the Apostle Parish in Indianapolis, Wessel sees this outreach as a response to the call of Pope Francis. This year, the Archdiocese of Indianapolis has 14 seminarians in priestly formation. This is a smaller number than last year in part because six men were ordained priests for the archdiocese in June. One of them was Father Matthew Tucci, associate pastor of St. Christopher Parish and chaplain coordinator of Cardinal Ritter Jr./Sr. High School, both in Indianapolis. He was the homilist at an Aug. 9 Mass with the seminarians celebrated in the cathedral’s Blessed Sacrament Chapel in which the other five newly ordained priests were concelebrants. Looking back on his years of priestly formation, Father Tucci said the seminarians’ annual convocation played an important role in helping him discern God’s call in his life. “The camaraderie with your brothers—that was the biggest of all,” said Father Tucci in an interview after the Mass. “The bonding time is the best part of it.